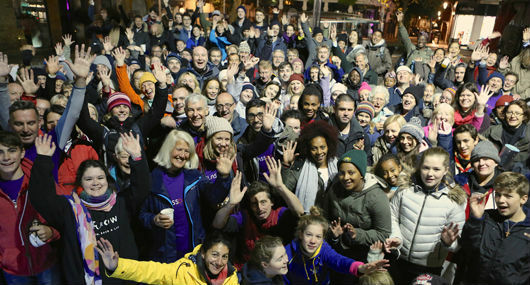 Hundreds of individuals will be sleeping out at Duke of York Square on Friday, 5 October in what will be our SIXTH annual Glass Door Sleep Out. By sleeping out for one night, you can give shelter to someone who has nowhere else to turn. You must register online to reserve your spot. Alternatively, call us on 020 7351 4948 during working hours. Participants must be at least 11 years old (11 to 15 year-olds must be accompanied by a parent or guardian). There is no registration fee nor minimum fundraising requirement, but we encourage participants to aim to raise at least £500. Don't worry: we offer guidance and support with fundraising all along the way. We'll even set up an online fundraising page for you if you like. On the night, participants will need to bring a sleeping bag and mat and/or cardboard. To learn more about what to expect on the night, click here. WHAT ARE WE RAISING FUNDS FOR? Glass Door operates night shelters in churches for homeless men and women in the winter — from early-November to April. We aim to raise £200,000 to ensure we can run all our shelters next winter, allowing about 100 men and women a safe, warm and dry place to sleep every night during the coldest months of the year. We are London's largest emergency winter night shelter, and we are the only one you do not need a referral from another agency to access. Last year, over 300 participants raised over £150,000. Thanks in large part to the success of Sleep Out 2016, more individuals were able to find meals, shelter and support in our network of church-based shelters this past winter than ever before. By joining or supporting this year's event, you will be helping to bring someone in from the cold. FOR MORE INFORMATION, email us at [email protected]. You can also phone our office at 020 7351 4948. Learn more about Sleep Out 2016 here.